Since 1999, Eclat Roofing has brought commercial roofing services to Dallas, TX! We want to help our customers get the most out of their company’s roofing system. That is why we offer repairs, maintenance, replacements, and installations for all commercial roofs! All of the materials we offer can help the roof over your business last for decades. Call our expert local roofers now at (214) 373-1500 to schedule your commercial roofing service! Most commercial roofs, like the ones below, are flat or low-slope roofs, which have special requirements and maintenance demands to keep them working properly. We can work with any commercial roofing material! Built-Up Roofs: This type of roofing system is durable, incredibly waterproof and long-lasting! You won’t have to worry often about the state of your roof if you choose this system for your commercial building! 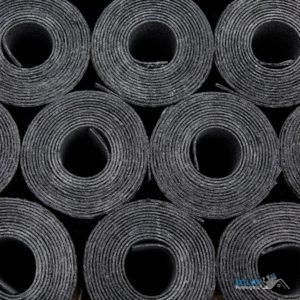 EPDM Roofs: Rubber roofs are hail and UV resistant with long lifespans, similar to built-up roofs. These commercial roofing systems are effective against most Texas weather, wind, rain, and beyond! Modified Bitumen: This is an asphalt-based roofing system that has several different installation techniques. These roofs are hail-resistant and easy to fix if there is damage. The one drawback with this type of roof is it is not a good material if your roof sees a lot of foot traffic. TPO Roofs: Typically a reflective white, this type of rubber roof is known not only for its durability, but also its energy efficiency. Installation includes a layer of insulation under the roofing material. It can last decades with proper maintenance and prompt repairs. The roofing contractors we hire are experienced in commercial roofing techniques and materials, so they can help you determine what type of roof would be the best for your business depending on your budget, needs, and climate. We want to make sure the job is done right, which is why we have multiple inspections during and after roofing services, especially installations. Eclat Roofing has relationships with the best roofing vendors in the area and always offers competitive prices for our services. We have an A+ rating from the Better Business Bureau and always encourage potential customers to read the reviews of our fantastic roofing company! Our roofers are happy to serve all Dallas, TX commercial roofing needs, as well as those throughout the great state of Texas and even in Louisiana and Oklahoma. If you are ready to begin your roofing services with a reliable company, call us now at (214) 373-1500! Updated on September 13, 2018 at 3:02 pm by Eclat Roofing.